There Was an Election: Is a Market Correction Coming? With the exception of recent weeks, where uncertainty about last Tuesday’s election dominated conversation (more on that in a moment), typically, the two most commonly asked investment questions I hear are: Is a stock market correction inevitable, and, when will the next one be? My answers are always the same: Yes, and nobody knows. First, some background regarding the language that is most commonly used to describe large market movements. A market correction is a reverse movement, better known to you and me as a decline, typically of more than 10 percent. 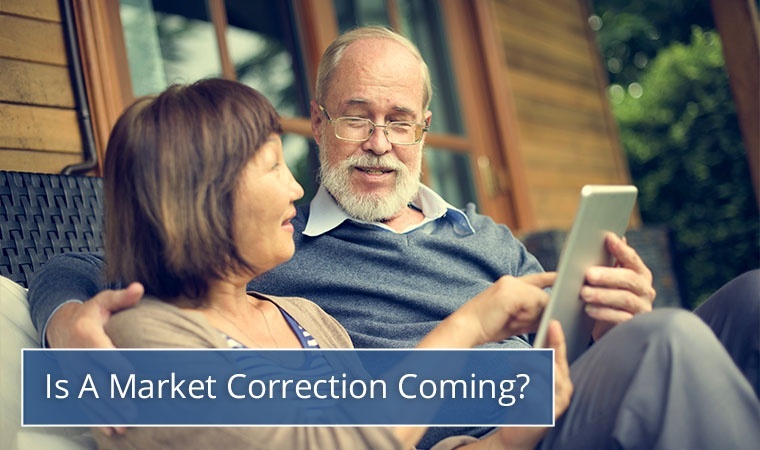 Often in response to speculative “bubbles,” such as the Dot-com Bubble that occurred between 1995 and 2001, stock market crashes can be caused by the overreaction of panicked or worried investors. Technically speaking, a stock market crash is a dramatic drop across all or most stock sectors resulting in a 10 percent (or more) decline in prices in a single day. A bear market occurs when there’s a decline of 20 percent (or more) from market highs over a two-month period. Just about everyone’s favorite type of market, a bull market occurs when there’s a prolonged period of rising stock prices. (*We’ve actually been in a bull market since 2009, making this the second longest bull market in U.S. history [1987-2000 was the longest]). While the stock market could still experience a decline because of Tuesday’s presidential election, it’s just as likely to dive because the Fed adjusts interest rates too quickly, we experience an oil shock, or the advent of a new war. To be clear, stock markets don’t typically respond well to political uncertainty. After Tuesday night’s election, the results of which contradicted many major polls, there were some economists that feared a major decline was imminent. That has yet to materialize. But in regard to the election and what might still happen, is there anything we can do to prepare? 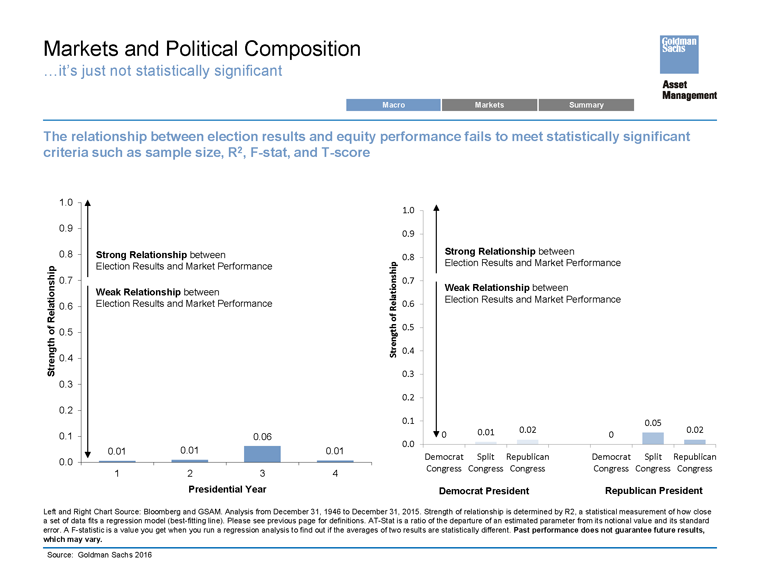 A little background: below are two graphs that speak to the stock market and past presidential elections. 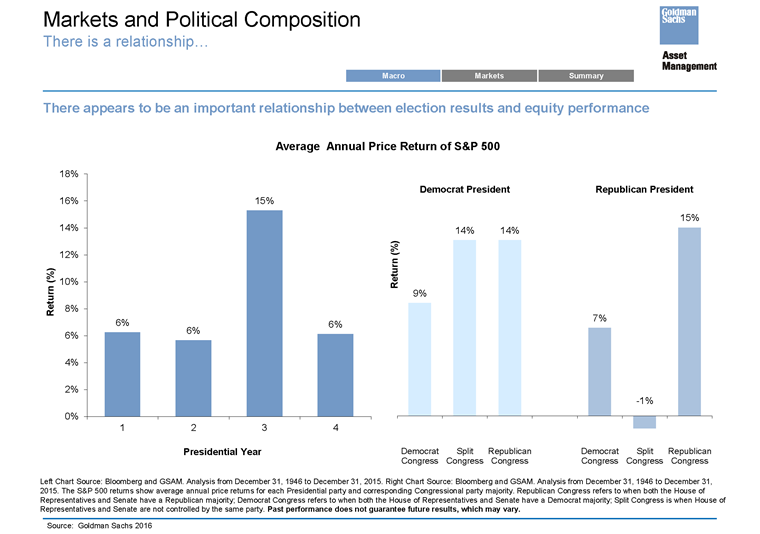 The top graph would appear to give the impression that stock market returns improve in certain scenarios, including when a Republican President has a Republican Congress, or when a Democratic President has a split Congress. Yet, taking it deeper, graph #2 seems to bear out that those trends are not statistically significant, and that markets generally do about the same no matter who’s in the White House. Four years ago, a lot of people were anxiously trying to buy gold. Naturally, that’s because the price was high, and no one wanted to miss out on this seemingly sure thing. Of course, the price of that precious metal quickly went into decline, and soon after that people stopped asking about gold. But until the price of gold actually began to decline, many people remained confident that the value would continue to rise forever. The damage done by the perceived value of gold in 2012 was minor compared to the inflated value of homes in 2005. Instructed to ignore credit worthiness, banks gave loans to people to buy homes with mortgages their incomes couldn’t afford. This easy access to money created a buying frenzy that pushed prices unsustainably high, and this eventually resulted in a recession as consumers went further into debt by borrowing against the equity in their over-valued homes. It takes restraint to remain calm while everyone else is getting excited about a popular investment or a rising stock market. But, sooner or later, and, I’ve said this many times before, speculative bubbles almost always burst. I’m emotional. You’re emotional. Most of us get upset with rude drivers or when our kids don’t clean their rooms. But the repercussions of getting mad at someone who doesn’t use their turn signal pales in comparison to the damage that can be done by investors who react fearfully and “sell” when the market is merely experiencing a correction. Over-reactive investors who are motivated by fear can cause small market corrections to become large ones, and large corrections to become crashes as everyone heads for the door (or liquidates all of their investments in a panic). While behavioral finance can hasten (or worsen) market corrections, another, simpler reality is that markets typically go through cycles. Sometimes stocks go inexplicably high, while other times, they move lower. It’s the nature of the beast, and my experience has been that the best way to “beat” the market is to outlast it. Simply, stay true to your long-term investment principles and good things are likely to happen to you over time. Some investment professionals will tell you that they’ve got the market figured out. They don’t. I’ve been an advisor for 25 years and it’s been my experience that the best defense against corrections (or crashes) is to not try and “time” the market. Simply, don’t jump in and out in an attempt to try and predict where the market is headed. Lastly, know your precise investment risk tolerance, and insist on working with a fiduciary advisor who will build you a well-diversified portfolio that should help to minimize your exposure to market downturns. To find out more, meet with an advisor to determine if your investment portfolio matches up with your long-term goals and risk tolerances.